SC Senator Lindsey Graham (capital R) got a taste of the tea-bagger medicine at a recent town hall meeting. Lunatic fringe anyone? "Angry attendees in the crowd interrupted Graham with cries of, 'You're a country club Republican,' 'Sotomayor!,' and 'You lie.' Outside the event, right-wing activist Julliet Kozak picketed the town hall with a sign decrying all 'Unconstitutional Anti-Christ Socialist Federal Deficit Spending Programs.'" Brad Johnson, meanwhile, collected reactions to Graham from prominent far-right blogs, where the South Carolinian has been called a "fake Republican," "RINO" (Republican in name only), a "traitor," "disgrace," "asshat," "democrat in drag," and a "wussypants, girly-man, half-a-sissy." It's worth taking a moment to acknowledge Lindsey Graham's voting record here. The right is livid about his vote to confirm Sotomayor and his support for reforming U.S. energy policy, among other things. But given the apoplexy, one might think Graham had suddenly moved to the center. He hasn't. In the always-helpful VoteView analysis, Graham is the 83rd most conservative senator in the current Congress, meaning only 17 senators are to his right. 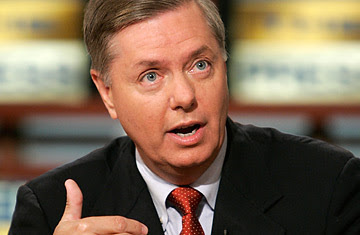 Graham is not only more conservative that most of the Senate, he's more conservative than most Republicans."